He found himself not in a hayloft but in a very large low-ceilinged apartment that was evidently a bedroom. In the winter twilight he could see that the table, the mantelshelf and even the armchairs were cluttered with tall vases, expensive objects of every description, and old weapons. One end of the room was cut off by hangings which no doubt concealed an alcove. Meaulnes had closed the window, partly because of the cold, partly for fear of being seen from outside. He crossed the room, drew aside the hangings, and discovered a broad low bed heaped with old books in gilt bindings, lutes with broken strings, candelabra - all thrown down pell-mell. Pushing everything into a corner he lay down to rest and sort out the elements of this strange adventure into which he had plunged. I looked around the room. An astonishing medley of objects lay around in piles which in place reached up to the ceiling. The contents of the room had a sort of strange cohesion and homogeneity, and they seemed to adhere to the walls like the contents of a half-empty jam jar. Yet here was every kind of thing. It was like a vast toy shop that had been hit by a bomb. In my first glance I noticed a French horn, a set of red-striped tin trumpets, some Chinese silk robes, a couple of rifles, Paisley shawls, teddy bears, glass balls, tangles of necklaces and other jewellery, a convex mirror, a stuffed snake, countless toy animals, and a number of tin trunks out of which multi-coloured costumes trailed. Exquisite and expensive playthings lay enlaced with the gimcrack contents of Christmas crackers. I sat down on the nearest seat, which happened to be the back of the rocking-horse, and surveyed the scene. He remembered her words: "You are a good man." Usually have - as he knew - cold hearts. I don't know - said the goddess - whether you loved her or not. They stopped too, and the echo faded. 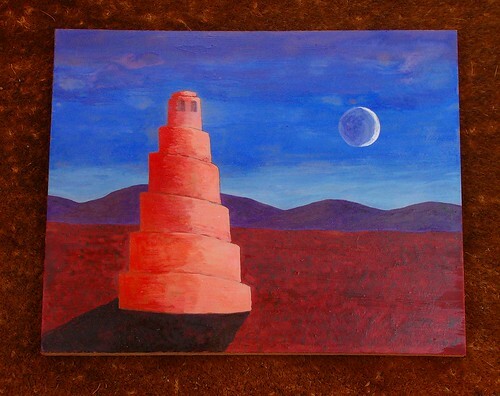 I haven't painted anything other than walls since I was at school, so this came out quite well considering. 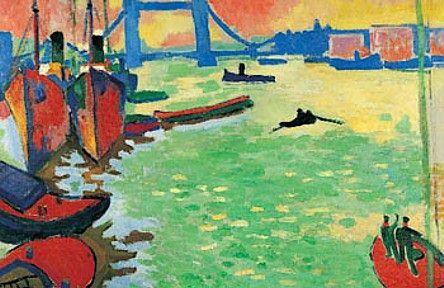 Talking of paintings, the Courtauld have a Derain exhibit: The London Paintings, opening on the 27th, running til 22nd January. If I'm lucky I'll even get to see it. Some days you don't feel that you're real at all; everything is contingent. Today I'm sitting on a plane, in a lost corner of an aerodrome: outside there's frayed concrete and tumbled weeds, the day is grey. We're waiting, because there's fog at our destination: even now aeroplanes are nervous about fog. Across the aisle there's an editor, a woman with glasses on a string round her neck. She's reading a manuscript. The front of it doesn't mention an author; there's just one word: Londonstani. We're going to a book fair. Then we're tilting up and almost straight away the grey turns to bright solid blue, and in the centre of the window the moon, saying to me as always, Hello. Here I am.